Road into Dry Creek Canyon. Rim Road is on...the rim! Where the road dips down along the canyon wall, that's point C on the GPS map. 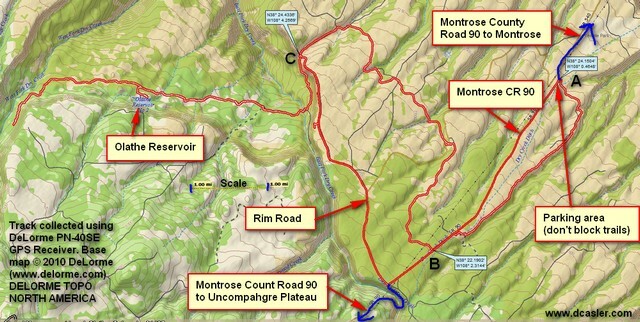 On July 8th, Woody Woodrum and I met at a spot (see Point A on map) about 1/3 the way from Montrose up to the National Forest area of the Uncompahgre Plateau, which makes this BLM land. I had no idea the area held cool and challenging trails, but Woody had been here before and wanted me to see it. I’m glad I went! The entire route was what might be called high desert, so we weren’t into the big trees, but did find lots of pinion and juniper. There were a few wildflowers, but most of those are at higher elevations. We headed southwest from the parking area along a road that follows the rim of an unnamed canyon. I’d rate the trail as intermediate. Woody was on an ATV and I was on my Yamaha dirt bike, so I’d go on ahead and he’d catch up. Every time I came to an intersection (and there were many—we barely began to explore the area) I’d wait. We found our way back out to CR 90. Woody stands by his trailer--his ATV is on the left. You can see my Yamaha XT-250, which I'd just unloaded from my trailer. We got an early start because the afternoons and evenings can be rainy. We had brilliant sunshine and by the time we finished at noon, the clouds had just started to form. You don’t want to be caught in this area when it’s wet as the dirt turns to sticky red mud. At Point B on the map, we headed northeast, again into a maze of trails with many options. Note that some of the roads on the DeLorme GPS map, shown in black or yellow, aren’t really there. We worked our way around to Point C on Rim Road. Woody hadn’t been down into Dry Creek Canyon. We decided that as we were there, had time, and may not be back this way for some time, we should explore. The photo at the top of this post shows how the road runs down the canyon wall. As you can see from the GPS map, it heads west from there, getting rougher and rougher. About halfway on our trek, we found Olathe Reservoir No. 2, shown below (not very big but Woody’s heard the fishing’s good here). Olathe Reservoir No. 2, not terribly large, but Woody has heard the fishing's good. Dry Creek Canyon ride GPS map. I tried putting in lat/long markers, but they're too small to read. See text below. The scale between the vertical blue lines is one mile. I don’t recommend going into this area alone. It’s well off the beaten track and the roads, other than Rim Road and CR90, can be rough. But it’s quite beautiful. I close with a shot take from inside the canyon looking north. That’s Grand Mesa in the distance. View down Dry Creek Canyon. That's Grand Mesa in the distance. 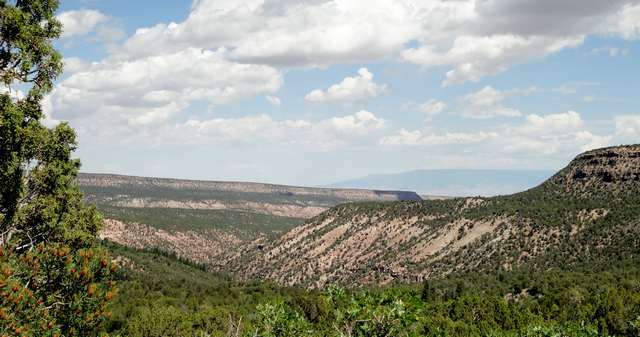 This entry was posted in Montrose County, Motorcycling and tagged dry creek canyon, uncompahgre plateau. Bookmark the permalink. Hi Alfred, I use DeLorme Topo North America. I use a DeLorme PN-40SE GPS. I’ve not found the DeLorme maps very accurate below the street level. That’s why I’ve created the GPS track maps for the website. What I’ve found here in Western Colorado is that there really aren’t any good maps that include all the trails, particularly the ATV (50-inch) and single track trails. You can ask at Davis Service Center in Montrose; they have some maps with some of the trails. Good luck! My dirt-bike days are over, and my wife and I don’t get out often on the Polaris RZR, but I’ll keep trying to post GPS tracks. Thanks for your support of the website!